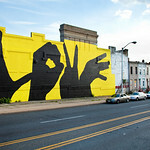 "Baltimore-based artist Michael Owen created an image of four hands spelling out the word "love." Through the Baltimore Love Project, he is painting this image on 20 walls spread evenly across Baltimore City, connecting people and communities with this common theme. This mural was co-sponsored by Kickstarter campaign supporters, Figure 53, Sangha Solutions, Gartner Family, Bladow Family, Sherwin Williams, and Sunbelt Rentals.